The HP D3600 direct-direct attached storage array is a 12-bay model in the HP D3000 enclosure family offering end-to-end 12Gb SAS. With double the transfer rate of previous generation 6Gb solutions, the D3600 storage enclosure adds crucial bandwidth to your high capacity storage needs. The D3000 enclosure family offers a modular solution designed to grow as your storage demands increase. The D3600 allows you to add up to 96 drives or up to eight D3600 enclosures. The 12-bay LFF D3600 enclosure and the 25-Bay SFF D3700 enclosure can be mixed and matched to allow for up to four D3600s and four D3700s for expansion up to 148 drives. The D3600 is ideal for remote offices, departmental locations, or small application environments. Get affordable, high-capacity, tiered external storage today and click below to customize or add to cart to buy today! 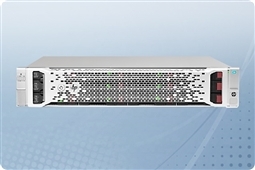 Wondering if HP StorageWorks D3600 Direct Attached Storage (DAS) arrays are best for your business continuity and budget? Check out our Survival Guide: Avoiding A Data Apocalypse today! Expansion Capabilities: Up to 8 enclosures cascading off single SAS port for up to 96 3.5” HDDs. D3700 and D3600 enclosures can be mixed and match for up to 768TB. Dual domain SAS creates redundant pathways from servers to storage devices to reduce or eliminate single points of failure within the storage network. SAS drives required for dual domain. 18TB (6 x 3TB) 7.2K 6Gb/s SATA 3.5"